These past couple of weeks have been exciting ones. Music in general is great, but some moments that are more gratifying than others. I've been experiencing one of those peaks these past couple of weeks watching these songs that I've written come alive with the arrangement and polished sound design that Dean and I have been laying down. It's kind of like finally seeing a idea that you've scratched out on a napkin turn into a full fledged painting. You think..."that's what I really was creating!" So we've been hard at work in the studio making it happen. We've only got one more session for mastering, and then the songs are ready to go! It's hard to believe the moment has finally arrived. Also, with every project comes artwork. I'm excited to say that I'm working with Jacob Hansel again for the album artwork. He was the artist who created the Man & the Mountain artwork for the Songbird EP, and we loved it. This album is different, but the artwork is shaping up to be equally as awesome. I'm very excited about this whole project from cover to cover....literally. :) Here's a preview using a scratch idea that was later fleshed out for what will be the some of the album art. 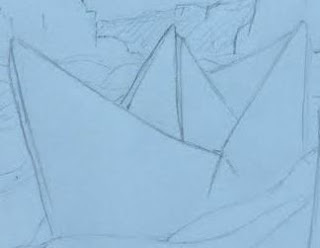 Keep in mind this is a scratch pencil idea...I can't show you everything and ruin the surprise! So very soon, you'll see the finished version of everything up and ready for you to experience. I'm counting down the days!